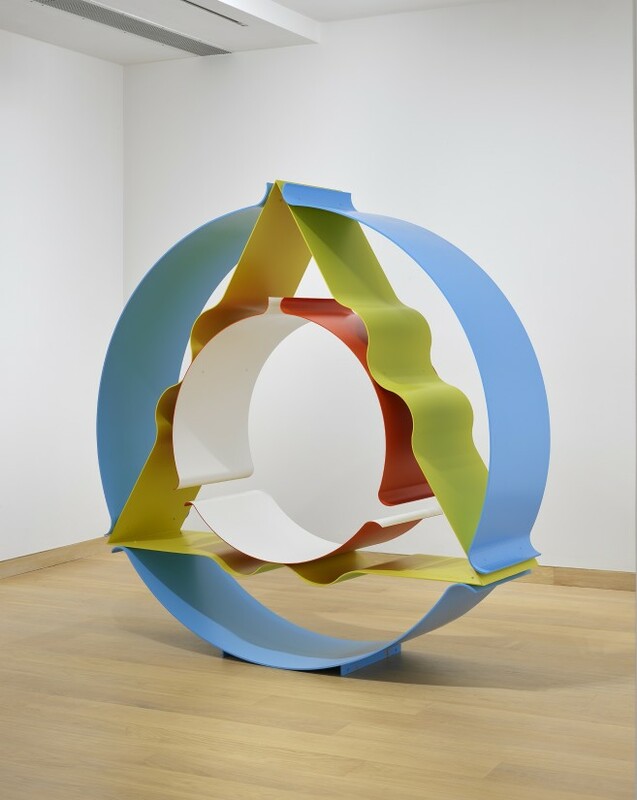 Three sculptures by David Annesley at Waddington Custot (until the 6th of January) use colour to very striking effect. My understanding is that all three were made recently under the supervision of the artist, completing editions from the sixties that were not fulfilled. They were conceived in 1968 and 1969. All three polychrome sculptures have similar but not identical structures, based around the interaction of circular and triangular shapes, their basic geometry enlivened by wavy lines – a very common feature of the art of the sixties – and curled corners. They follow the paintings of Kenneth Noland and the sculptures of David Smith, and ultimately, Josef Albers’s series Homage to the Square. Although the colour is the most important thing, it is not quite right to say that the format is neutral. For one thing the scale is vitally important, both for creating a relation to the body, and for giving colour space to operate fully – the smaller sculptures on display are much less effective. The manner in which triangle and circle interact is also important to their contained dynamism, or to put it the other way around, their enlivened stability.